Size 19.5 x 28.25 inches. 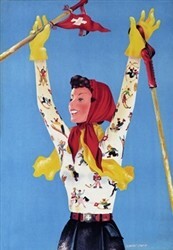 Classic Swiss skier celebrates her triumph. Swiss skiers have always been highly competitive with some of the most devoted fans cheering them on to victory, often by waving the Swiss flag and ringing their cow bells. 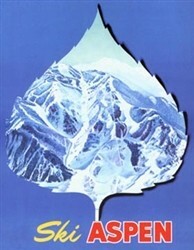 All through Europe, tens of thousands of spectators show up to watch their favorite ski racers compete. In Switzerland, a successful ski racer becomes a national hero, much like American football players. 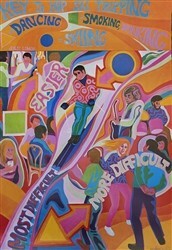 This stunning Ski Poster catches the spirit of ski racing. Note all of the winter sports activities displayed on her incredible turtle neck shirt. Oh, how we wish we had this shirt in our vintage clothing collection! Quality reproduction.